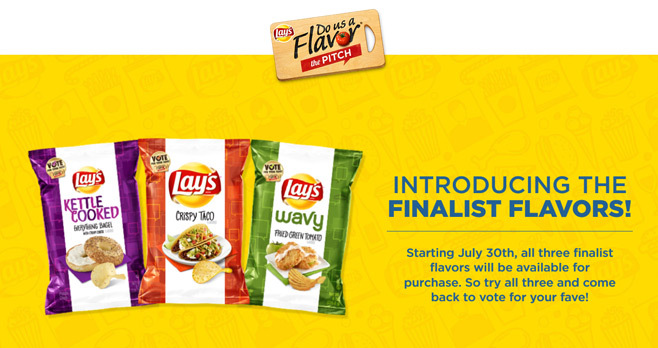 Starting July 30th, all three Lay’s Do Us A Flavor Finalists will be available for purchase in stores nationwide. Try them all and vote for your favorite Finalist Flavor in the Lay’s Do Us A Flavor Contest to decide the $1 million grand prize winner. By voting, you could also have a chance to win awesome prizes every day. You can vote daily on www.lays.com, via Twitter and Instagram using the hashtags #SweepstakesEntry along with #VoteEverythingBagel, #VoteFriedGreenTomato or #VoteCrispyTaco, or via Snapchat by swiping up on your favorite finalist flavor. 2 / New York Trip: Trip for winner and one (1) guest to New York, New York. Trip consists of round-trip coach air transportation (from major airport nearest winner’s home); double-occupancy hotel accommodations for three (3) nights; ground transportation to/from airport and hotel; and $500.00 spending money which may be used towards a Ben’s Bagel Tour, a Circle Line boat tour, and a brunch at Sadelle’s. ARV: $6,000.00. 231 / Premium Water Bottle. / ARV: $25.00. 231 / Flavor-inspired Slogan Shirt (size Large). / ARV: $20.00. 231 / Hawaiian shirt (size Large). / ARV: $30.00. 231 / Onezie. / ARV: $50.00. 2 / San Antonio Trip: Trip for winner and one (1) guest to San Antonio, Texas. Trip consists of round-trip coach air transportation (from major airport nearest winner’s home); double-occupancy hotel accommodations for three (3) nights; ground transportation to/from airport and hotel; and $700 spending money which may be used towards a food tour, dinner at Casa Rio, and a taco cooking class. ARV: $6,000.00. 231 / Phone Case. / ARV: $20.00. 231 / Pool Float. / ARV: $25.00. 2 / Savannah Trip: Trip for winner and one (1) guest to Savannah, Georgia. Trip consists of round-trip coach air transportation (from major airport nearest winner’s home); double-occupancy hotel accommodations for three (3) nights (daily breakfast at hotel included); ground transportation to/from airport and hotel; one-hour spa treatment; and $700.00 spending money that may be used towards a cooking class, a Savannah Culinary & Cultural Walking tour, and a dinner at A.lure Restaurant in Savannah. ARV: $6,000.00. 231 / Wrapping Paper Spool. / ARV: $20.00. 231 / Corn Hole Set. / ARV: $200.00. Total ARV of all prizes: $146,880.00. The Sweepstakes is open only to legal residents of any of the 50 United States, the District of Columbia or Puerto Rico, who are 13 years of age or older at the time of entry. Sweepstakes begins at 12:00:00 p.m. (noon) CT on July 24, 2017 and ends at 11:59:59 p.m. CT on October 8, 2017. The Sweepstakes Period is divided into 77 daily entry periods. Each day of the Sweepstakes Period represents a separate daily entry period. Limit one vote/entry per Day per Entry Method per person throughout the Promotion Period. Limit one bonus entry per Day per person/email address/social media account per platform – for a total of 2 bonus entries per day per person/social media address. For each Finalist Flavor, 12 Daily Prize winners will be selected for each Day of the Sweepstakes Period in a random drawing to be held on or about each business day following the applicable Day from eligible Entries received for a given Day. For each Finalist Flavor, 2 Grand Prize winners will be selected in a random drawing from among all eligible Entries received on or about October 10, 2017. 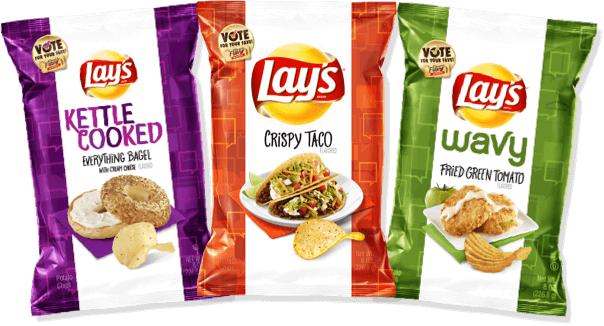 For the names of the winners, send a self-addressed, stamped envelope to be received by November 8, 2017 to: Lay’s Do Us A Flavor The Pitch Voting Sweepstakes Winner’s List, 10 South 5th Street-7th Floor, Dept. 880-768A, Minneapolis, MN 55402. Sponsored by Frito-Lay, Inc. 7701 Legacy Drive, Plano, TX 75024-4099. For complete details, including Official Rules, visit www.dousaflavor.com.